We went in on a Monday night around 8ish. The restaurant was literally quite empty, save for one other pair who was just finishing up and the occasional passerby for take-out. All the better for us – service was quick and timely. 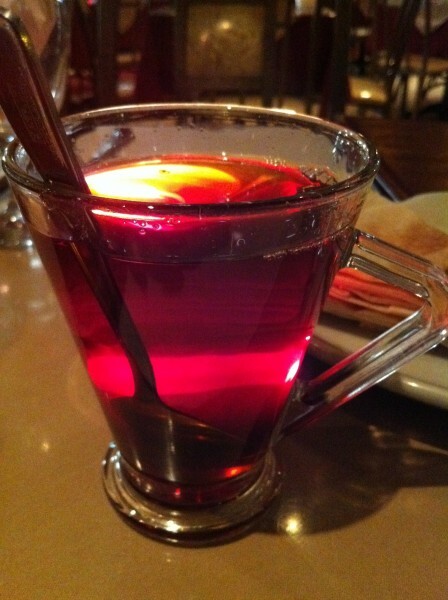 Served steaming cups of cardamom tea to begin, I stepped back and let my friend do the ordering – he seemed to have a few favourites he was eager for us to eat. While waiting for our courses to arrive, we munched on triangular sliced pita bread and half a raw onion – the customary starter entree dish. Being a raw onion lover, my friend dug right in and popped slice after slice into his mouth as if they were candy. At this point, onion breath slipped down the list of etiquette and personal hygienic concerns. We just gave up. The ash soup greeted us first – and no, there is no real ash in here. 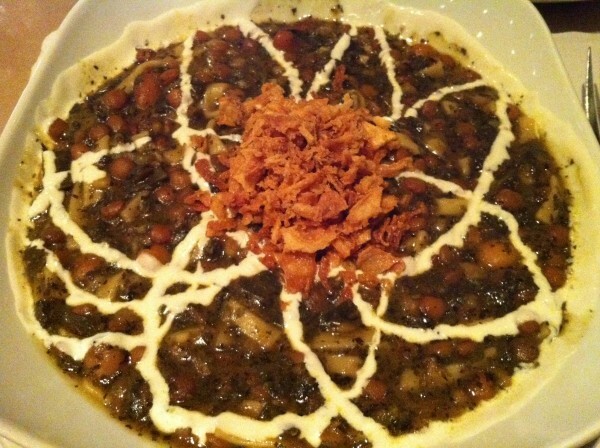 Made with a hearty mix of beans, noodles and spinach, the soup is a nice prelude to the meal. Admittedly, the bowl is large and the beans are relatively filling, but we both came with a ravenous appetite so this wasn’t an issue for us. Served hot, the portions were more than generous and the presentation was memorable what with the beautiful design made of yogurt artfully drizzled on top! The mirza, an eggplant-tomato-herb puree dish meant to serve as dip for the pita came next. Long as it was deep, the dish was incredibly large. We nibbled away at it and ended up taking this one to go. There was just too much left to come so we didn’t want to fill up pre-maturely. The main dishes arrived soon afterwards – we had the Sultani which came with filet mignon, ground beef brochettes and saffron perfumed rice as well as the Jooje Sultani, which was similar but replaced the filet mignon with chicken. Meat-heavy, the real stars of the dishes were the ground beef brochettes. Moist and well-seasoned, the meat was rich and filling, just right to hit that sweet spot. It was so tender it was easy to cut into with a fork. Finishing the meat on the plate was a challenge, at least for me. Heavy in nature, meat just fills you up real quick. 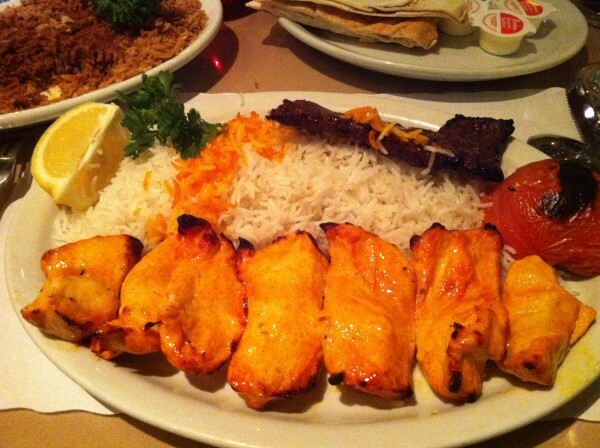 Chicken and filet mignon were nice as well – especially mixed in with a couple bites of tomato and the cranberry topped saffron rice. Yum. All in all, great Iranian/Persian fare at Tehran. Check it out! Tags: Ash, Beans, Beef Brochettes, Cardamom Tea, Dinner, Eggplant, Filet Mignon, forkandtell, Iran, Iranian, Jooje, Kebab, Noodles, Onion, Pita, Rice, Soup, Sultani, Tehran, Vendome Metro.